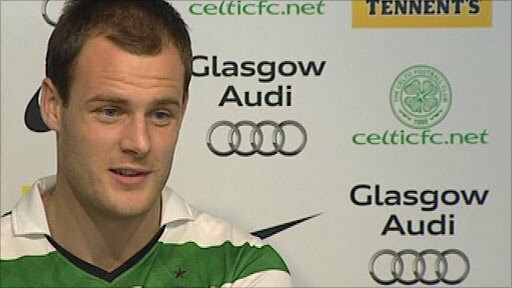 Hibernian striker Anthony Stokes has completed a move to Celtic on a four-year deal after the clubs agreed a fee on the last day of the transfer window. The Easter Road club will receive around £800,000 for parting with their top scorer from last season. The 22-year-old, who joined Hibs from Sunderland last summer, has three caps for the Republic of Ireland. "Hopefully I can do well and settle here," said Stokes, who is away on international Under-21 duty all week. Hibs manager John Hughes has replaced Stokes by agreeing a loan deal with Bristol Rovers for Darryl Duffy. Stokes headed a shortlist of strikers being targeted by Celtic manager Neil Lennon, with Hapoel Tel Aviv's Itay Shechter also considered. The Irishman first made an impact in Scottish football with Falkirk during the first half of season 2006/07, when he was on loan from Arsenal. "I look upon the move down south positively," said Stokes. "It was good experience for me down there and hopefully I'm coming here a better player. "I went to Sunderland and made a lot of mistakes and I'm glad I didn't do that here because I wouldn't have the opportunity that I have today to come here and hopefully score a lot of goals and try to be here for as long as possible. "I was probably a bit more immature then. I'm sure I still have a lot more to learn but coming here on the back of the goals I scored last year with Hibs will give me confidence as well." A £2m move from the Gunners to Sunderland followed, with the player rejecting the chance to join Celtic, and the striker had further loan spells with Sheffield United and Crystal Palace before making a permanent move to Hibs last year on a free transfer. At Easter Road, Stokes was reunited with his former Bairns manager Hughes and finished season 2009/10 with 23 goals, including two at Celtic Park. "It was very hard to turn down Celtic but it was just one of those things," said Stokes. "I went to speak to Keane and Sunderland had a chance of getting up. "We won the league and got into the Premier League. At that age, getting the chance to play in the Premier League was vital. "It's been in the papers for the last few days how many clubs I have had. "If it was up to me I would sign a contract for the rest of my career."